Grumpy Cat was one of the most popular topics tweeted during SXSW Interactive 2013 in Austin, TX. What does the obsession of an angry furry meme during a conference attended by technologists say about our culture, our minds, our businesses and the prospects for our long-term success? It says a lot. In the report from IDC, “Big Data, Bigger Digital Shadows, and the Biggest Growth in the Far East,” the prediction is that by 2020, almost half of cloud data driven by entertainment. Perhaps even more interesting is that most of the data collected is unexploited. The burning questions are, what does this say about our culture and what does it mean to the business opportunities? Is this funny pet phenomenon an indication of our civilization’s imminent decline? Is sharing a laugh via social media over animal with a bad attitude turning our brains to mush? If our brains are turning to mush, does this mean that business opportunities are in decline? Nope. It’s a good thing. In fact, sharing humor is one of the universal experiences that unites humans across the globe. And thanks to the proliferation of social media, people from all corners of the earth can share a positive experience with each other. Snickering at a silly cat photo can be fun and it can even help build a sense of community amongst people who would otherwise never interact with each other. This shared happy experience brings people together, unites us and shines a light on our similarities, rather than our differences. In an era when diverse cultures often clash, it’s uplifting to see diverse communities come together over a common love of humor. That’s not only a good thing for our cultures, but it’s a very interesting opportunity for business. 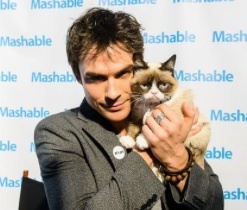 Mashable brought Grumpy Cat to SXSW Interactive 2013, inviting attendees to have their photo taken with the popular feline. The result was a massive amount of social media sharing which delivered big marketing buzz for Mashable. It also generated a huge amount of data on the behavior of the 18-54 year olds attending SXSW Interactive (96% of attendees this year were in this age group). In the weeks since the event, even more data has been collected about Grumpy Cat and his followers. A massive amount of data. Now think about what that data can tell us about human behavior. Huge amounts of data about individuals, their demographics, preferences, tastes and online behavior are being collected by social media. This is big data. People are communicating with each other in numbers and frequency never seen in the history of mankind. And social media collects every conversation, every post and repost. The worldwide embrace of social media is creating a mammoth amount of data which offers a clearly enormous potential for analytics. The value if big data is purely potential in its raw form. The information is only useful if it can be collected, integrated and analyzed. A terabyte of consumer data is meaningless if it can’t be manipulated into a useful state. And not all of the data collected is relevant to every organization. Businesses and governments have an unprecedented amount of information available to them about human behavior. Determining the most effective methods for aggregating and consuming that data is where the big opportunity is. Is there a correlation between the repost of a Grumpy Cat photo and an individual’s profession? Are millennials more likely to respond to online offers including humor than their older counterparts? Are 35-54 year olds just as likely to respond humor? What types of content resonate best with each demographic group? The answers to questions like these are a potential gold mine. We are talking about predictive analytics for consumer behavior. This is truly big. Big data = big opportunities. Over the coming months, we will see new business models evolve to meet the insatiable appetite that companies, government agencies and institutions have for analytics that enable these and other organizations to win hearts and minds. This is gonna be fun.